One thing is emerging as a universal truth -there is no right to smoke. Therefore, a landlord who restricts smoking is not discriminating against a class of tenants. Conversely, a landlord may have a duty to protect other tenants from second-hand smoke. Another universal truth: apartments where tenants are allowed to smoke cost more to maintain – a lot more, because removing the odor typically requires repainting, and professional cleaning of windows, carpets and draperies. Landlords everywhere are considering indoor smoking bans for health, fire, and financial reasons. There is ample evidence to support the decision. Cigarette smoking presents a fire hazard for which a landlord can be liable, especially when a tenant smokes in bed. A handful of tenants have received judgments against landlords for illnesses caused by exposure to second-hand smoke. In addition, a majority of tenants now request non-smoking buildings. Coming up with a manageable nonsmoking policy requires some forethought. Smoke-Free Housing Ontario offers a public service website with many helpful insights for landlords considering a smoking ban. For instance, landlords do not have to exclude tenants who smoke from rentals, nor do they need to probe the issue during tenant screening. They simply need to present the no-smoking policy, typically requiring the tenant to refrain from smoking indoors, on balconies or in common areas where others may be subject to second-hand smoke. So long as the tenant agrees to smoke somewhere else, they are not excluded from rental housing of their choice. Smoke-Free Housing Ontario provides this free sample no-smoking policy for landlords which includes a sample lease addendum. Currently there are two places in the U.S. that place specific legal responsibilities on a landlord regarding tenant smoking. The state of Oregon, and the city of Buffalo, New York both require landlords to disclose to a prospective tenant what the smoking policy is for that building at the time of signing the rental lease agreement, so those applicants seeking a strict no-smoking policy can evaluate the rental. In Oregon, all public housing must remain smoke-free. HUD, which oversees national public housing policies in the U.S., is asking all local public housing authorities to adopt a nonsmoking policy. Converting an apartment building or other rental property to nonsmoking presents a challenge for a landlord with existing tenants who smoke indoors. Under normal circumstances, a landlord is not required to evict a tenant who smokes; however, there have been a small number of cases where neighbors’ complaints prompted an eviction action based on nuisance, and courts have sided with the landlords in those cases. 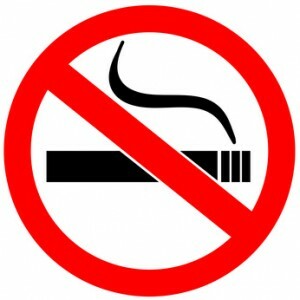 A no-smoking ban can be added to house rules incorporated into the lease, as a lease addendum, or as a condition in the lease. Whether a landlord can fast-track the nonsmoking policy depends on whether they reserved the right to change tenant policies upon short notice. That determination may require legal counsel, or, many experts suggest viewing the smoking ban as a phased-in process instituted voluntarily through a lease addendum. Otherwise, a landlord may wish to update their rental lease agreement, and wait until new lease signing. Previous post: Will Your Lease Protect You When It Counts?